This entry was posted in Poetry and tagged American Poems, American poetry, Emily Dickinson, I'm Nobody, Poem, Poems, Poetry on May 24, 2018 by The Mithril Guardian. This poem by Emily Dickinson is one of my favorites. I have read poetry – or have had it read to me – for years. There is nothing like hearing words cascading on the ear in a pleasurable rhythm! But I did not find Emily Dickinson’s poem I’m Nobody in a book of poetry, readers. I discovered it on the back of The Mouse of Amherst. In this case that would be Amherst, Massachusetts, home of the famous Emily Dickinson. It seems that Miss Dickinson’s poetry has undergone some sort of revival of late. Her work is fantastic, certainly, but she received next to no recognition for it during her lifetime. Most of her poetry was published posthumously. Part of the reason for this is that the publishers of the time had no idea how to categorize her work. Miss Dickinson’s poetry did not conform to the poetry published during her time. In fact, many of her verses seemed “uncontrolled” and out of sync with what was considered “real” poetry. This has led to innumerable stories being published about the reclusive Miss Dickinson in recent memory. The Mouse of Amherst is one such novel. 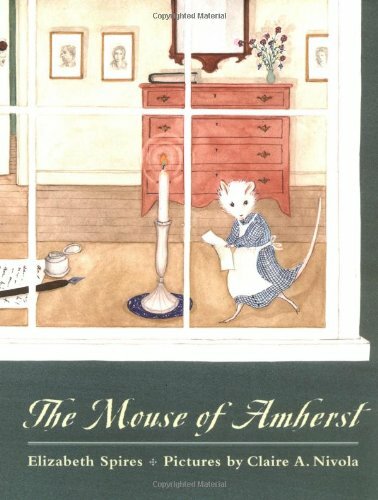 Written for young children, The Mouse of Amherst introduces the reader to Emily Dickinson and her poetry from a unique perspective – through the eyes of a mouse that has moved into the wainscoting in Miss Dickinson’s room! This young white mouse is Emmaline. As any other young mouse, Emmaline’s primary concerns are avoiding the cat and surviving. Yet she senses something about such a life is not fulfilling. It is dull and monotonous; there is nothing to fill her hours except eating, sleeping, and avoiding danger. Until she moves into her new room, and discovers a welcome gift from Miss Dickinson. It is an inkwell and a feather pen, both mouse-sized. Underneath the inkwell is a poem from Emily Dickinson to Emmaline Mouse (though naturally Miss Dickinson has no idea of her new roommate’s name). Thus begins the pen pal relationship between the great poet and the small mouse. The two exchange poems and Emmaline encourages Miss Dickinson when her poetry is once again rejected for publication. The strange friendship, however, has its risks – a ball of fur with nine lives, teeth, and claws! The Mouse of Amherst is a sweet little book fit for any child, though it will probably appeal more quickly to girls than to boys. Everyone should be exposed to good poetry in their life at some point. The Mouse of Amherst is a fine introduction for children to the ticklish, tightrope world of poetry. This entry was posted in Book Reviews, Youth Books and tagged American poetry, Book Reviews, books, children, children's stories, Claire A. Nivola, Elizabeth Spires, Emily Dickinson, fantasy books for children, I'm Nobody, mice, old books for children, Poems, Poetry, The Mouse of Amherst on September 1, 2016 by The Mithril Guardian.